Add butter to casserole dish or heat-safe skillet and place in oven to melt. 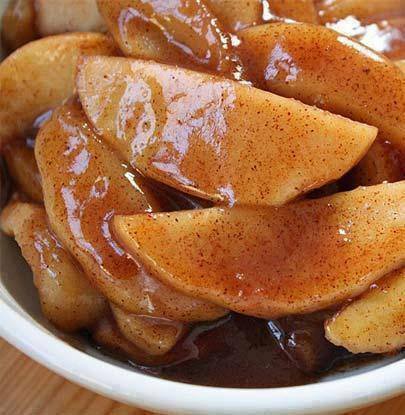 Meanwhile, place apple slices in mixing bowl and toss with brown sugar, white sugar, cinnamon, allspice, and cloves. Add apple slices to melted butter, stir to coat. Roast at 400 degrees for 15 minutes. Remove apples from oven. Stir together water and cornstarch and add to apples. Stir to combine. Return apples to oven for an additional 5 minutes, or until syrup is thickened slightly and apples are tender. Let cool 5 minutes before serving.